Why Buy Your Next Drum With Us? DrumConnection - Boston's real drum shop. THE place to go for hand drumming! Hear what your drum sounds like before you buy it! It only makes sense, I know, but with internet buying you cannot hear the sound or experience the feel of the drum. If we are talking about real djembe or congas, with real animal skins, (even plastic ones) no two drums sound the same. For real! I'll repeat, "It is not possible for two drums to sound the same." Take the time to MAKE SURE YOUR DRUM IS RIGHT FOR YOU. We have that kind of time for you, so visit us today! Drums are likely the oldest form of musical instrument known to mankind. So old in fact, that researchers from the National Academy of Science suggested that drumming is part-and-parcel to our species - other primates also drum on objects to communicate. Drumming might very well be something we as human beings have evolved to do. The art of drumming has also in various forms, become an integral component of cultures the world over, from East Asian war drumming , to the talking drums of Sri Lanka and West Africa. These instruments are not only universal in nature, but they are tied to our very humanity at the deepest level. DrumConnection (Boston, MA) links students with a very specific part of our human heritage - the djembe drum music of Guinea. Guinea is just a small nation on the west coast of Africa yet it looms large on the world stage. 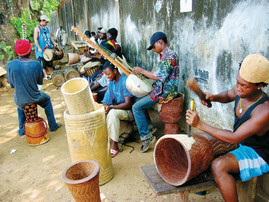 DrumConnection offers a unique experience into the rhythms of the continent. We also have trips to Senegal and The Gambia. It all began over 29 years ago in Arlington, Massachusetts as part of The Cambridge Center of Adult Education (CCAE), an adult education school adjacent to Harvard University. At first, it was just a few classes taught by Alan Tauber, the current director of DrumConnection. The popularity of the classes led to the program’s expansion. Today, it is the largest hand drumming school in the New England area and one of the largest in the country. DrumConnection has a teacher training program and over 10-14 instructors, each of them described by Tauber as a “treasure to the community”. We have trained dozens of drummers in the art of 'getting really good' and learning effective teaching techniques and how to set up a business or hobby teaching others to drum and help in healing arts as well. He further elaborates on his advocacy “We build djembe and dunun drums in Guinea and support African craftsmen and women to help them put rice on the table and aid in relief work in heath care, mostly malaria relief but necessary surgeries (3 this year alone), Typhoid, etc. When people attend our classes, attend our workshops or buy a drum from us, they are helping Africa as well.” By enrolling in the program, you aren’t just learning the drums from the best in the field. You are also helping others realize a better tomorrow. You don't know what it's like to get a phone call from Guinea and there is someone sobbing because someone is going to die without really fast help. And that's what we do. We set up the Guinea Fund 10 years ago and it is going strong today. If you'd like to know how you can save a life, please contact me. Fortunately for Africa - and for music lovers, DrumConnection’s 27 year long streak of bridging cultures through music shows no signs of slowing down. Their new storefront on Massachusetts Ave., Arlington, MA is a testiment to relentless training, business knowledge and a need to bridge the gap between western notions of music and actual African music itself. Passion for the craft probably didn’t hurt, too. “It needs to be accessible but must remain authentic. It also must be FUN! If a drum class is not FUN it is not worth holding it. Also, needs to be stress relieving/brain relaxing. For me, that is essential. It is all too easy to reinterperate the music of Guinea but we do not do just that. My Master Famoudou Konaté has dedicated his life to educating his students in the real deal. He, like other Africans, are concerned that the very essence of their music an culture may die when they die. We are not going to let that happen. While realizing that life and the future is unknowable (to most) we will do what we can to pass on our knowledge to others as our masters have asked us. We fear, like many languages, the language of the djembe, the truest language of the djembe/dunun will be unrecognizable in 20 years from now. Languages are disappearing one about every month or faster.